A 20.0 kHz, 16.0 V source connected to an inductor produces a 2.00 A current. What is the inductance? This is College Physics Answers with Shaun Dychko. 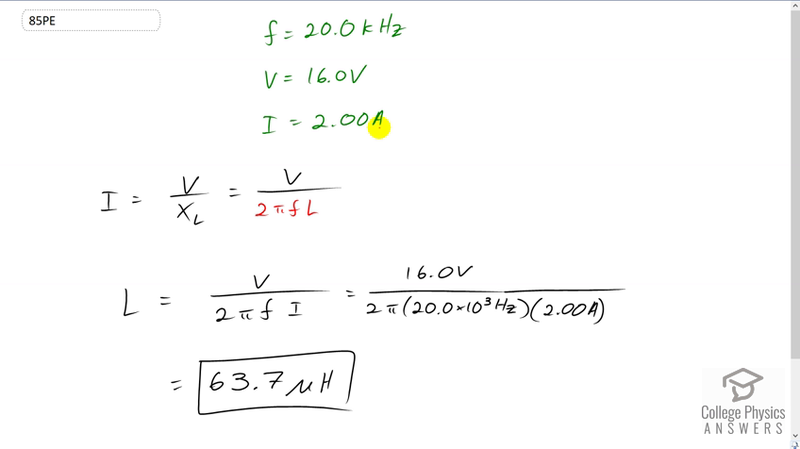 A 20 kilohertz, 16 Volt source is connected to an inductor and the current of two amps flows and the question is what is the inductance? So we know the current is going to be the voltage divided by the reactance and the reactance for an inductor is 2 Pi times frequency times inductance. So we need to solve this for L. So multiply both sides by L over I and we get that the inductance is voltage divided by two Pi frequency times current. So that’s 16 volts divided by 2 Pi times 20 times tenth to the three Hertz times two amps which is 63.7 micro Henry's.